You might not have heard about it, since, well, it’s a second-tier tournament and second-tier tournaments don’t get a lot of attention, but a pretty significant development in tennis happened over the weekend: Rafael Nadal got his most impressive wins yet since returning to competitive tennis from ongoing knee issues. He triumphed in a tournament in Acapulco without dropping a set in five matches (in fact, he was never even forced into a tiebreak), and had to beat two quality players – Nicolas Almagro and world No. 4 David Ferrer – in the semis and finals. And he didn’t just beat Ferrer – he crushed him, 6-0, 6-2. And celebrate he did. Tennis tournaments sometimes give their victors unusual ways to celebrate. Just as the Australian Open has been known to add some local flavor to the winner’s trophy in the form of a stuffed kangaroo (we think? 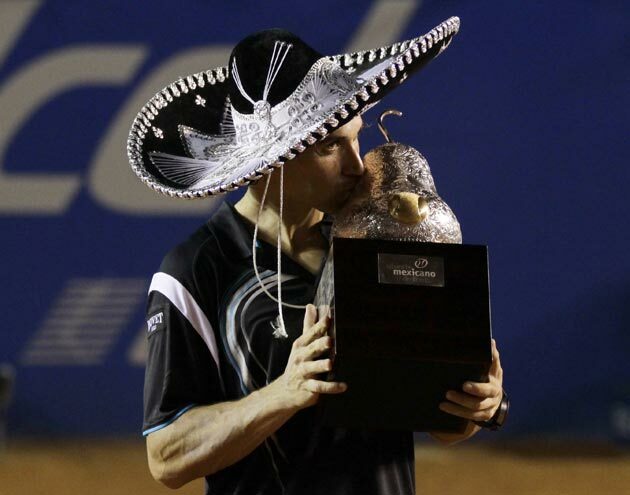 ), Acapulco also gets its winner into the local spirit. How do they do it? You see it above: a sombrero, in the style you might expect to see members of a mariachi band sport. But you wouldn’t expect to see it on Nadal… which makes it way funnier.